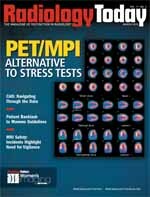 Physicians at University Hospitals Case Medical Center of Cleveland were using PET to image beating hearts before the technetium 99m (Tc 99m) shortage required many facilities to seek alternatives to nuclear stress testing. James O’Donnell, MD, director of the division of nuclear medicine and PET at University Hospitals, believes PET myocardial perfusion scanning is the superior technology anyway and that the shortage of Tc 99m will allow more physicians to see that. The Chalk River nuclear reactor in Ontario, Canada, which normally supplies about 50% of the world’s molybdenum 99 (Mo 99) used for diagnostic medical imaging studies, has been out of service since May 2009 due to a water leak and was still shut down when this issue went to press. Limited Mo 99 supply means reduced Tc 99m generator production. Bracco Diagnostics Inc manufactures rubidium Rb 82, the only FDA-approved generator-based PET myocardial perfusion agent used for detecting coronary artery disease, selling it under the trade name CardioGen-82. The agent is produced from an Sr-82 generator, which has a 28-day half-life and is available on demand; it is not reliant on Mo 99 supply. In light of the shortages caused when the Chalk River nuclear reactor went down, Bracco sent a letter to healthcare professionals encouraging them to consider CardioGen-82 as an alternative. In the letter, Bracco reported that CardioGen-82 had experienced double-digit, year-over-year growth during the previous five years and echoed O’Donnell’s prediction that it is on its way to becoming the standard for managing patients with coronary artery disease. Some who have been using rubidium for myocardial perfusion imaging (MPI) even before the shortage say they find it superior to nuclear imaging with Tc 99m or thallium for coronary artery disease. Thallium had been used until Tc 99m agents came along, and some have begun utilizing it again due to the Mo 99 shortage. Rubidium users say it is particularly helpful in difficult cases (eg, patients who are obese or have diabetes and women with large breasts or breast implants). Images are not only superior in quality to technetium studies but also faster to obtain. A PET scan takes about 35 to 40 minutes—the scan itself is 10 minutes—compared with a SPECT study that takes three to four hours. Many believe the imaging field would be moving faster toward PET MPI were it not for the high cost and the inability to conduct exercise-induced stress testing. Mimi Guarneri, MD, FACC, medical director and founder of the Scripps Center for Integrative Medicine in La Jolla, Calif., says her practice started doing PET imaging for heart disease in 2004, long before the current shortage. “We chose to bring it not because of a shortage,” she says, “but because the rubidium is a very potent isotope. It has a kiloelectron volt of 511, so it penetrates the chest wall in such a way that your patient can be obese, your patient can have large breasts or breast implants, and you still will have beautiful clear images. It provides the clearest images, especially in complicated patients who frequently have artifacts from obesity or from breast tissue or breast implants. For me personally, it is the ideal imaging modality for women and particularly for those patients who are overweight.” Guarneri says research confirms that CardioGen-82 PET offers imagers interpretive certainty of 96% vs. SPECT, which is 82%. Guarneri believes the movement toward PET MPI is often a matter of education. “We have found with the cardiologists here that once they see the PET cardiac images, their whole attitude changes. They start to prefer PET because it’s so much clearer,” she explains. While PET MPI is covered by Medicare and some private insurers, cost remains an issue, Guarneri says. Her center spends $30,000 per month for its rubidium generator and “that’s a lot of money.” Guarneri expects insurance companies that don’t yet approve the procedure will eventually. “It just takes time for insurance companies to catch on,” she says. O’Donnell notes that sometimes it’s a matter of getting preapproval from the insurance companies. PET MPI is not considered to be research or experimental, he says, since it is clinically validated. Obviously, imaging facilities need a PET scanner to perform PET MPI. Users say that’s no longer an issue for most facilities. “Today, PET is becoming standard technology for cancer patients, and many major institutions have a PET scanner,” Guarneri says. Kovac adds that many hospitals, especially larger ones, have a PET scanner and cardiac software capabilities for cardiac PET. “The numbers I have heard is that most places do four oncology studies a day, and so they have available time to shift over to cardiac patients,” he says. Facilities would need to maintain due diligence and determine whether patient volume exists to support cardiac PET imaging, Kovac adds, because there is a large fixed monthly cost for a rubidium generator. At some institutions, the cardiac PET scans are read by nuclear medicine physicians and some by nuclear cardiologists, Kovac says. PET imaging allows physicians to detect the buildup of plaque in the smaller arteries long before a big blockage is detected, O’Donnell says. If disease is detected earlier and treated with medications to lower cholesterol, blood sugar, and hypertension, a patient could be saved from having a heart attack or undergoing bypass surgery, he says. Guarneri expects the shortage of radioisotopes to remain a problem for some time. The Petten reactor in the Netherlands, the world’s other major supplier of Mo 99, is in need of regular maintenance and expected to go offline for some time. If things go well, the Chalk River reactor will be back up by that point, which the Canadian government recently promised would be the case. Meanwhile, in November 2009, the House of Representatives approved a bill to help fund production of Mo 99 in the United States. Still, Guarneri believes the reactors’ perilous and costly status is impetus for researchers to continue looking for new isotopes that will allow for less attenuation correction, less artifact, and shorter half-life.